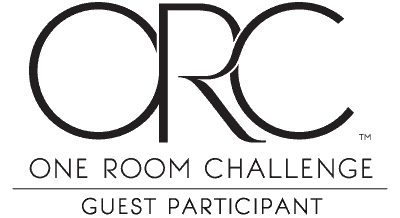 The One Room Challenge™ is an exciting and challenging DIY and home decorating event that provides and encouragement to anyone that wants to redesign their spaces – in six weeks! ORC features 20 veteran bloggers who post each Wednesday. On Thursdays guest participants like me share their room progress. The big reveal is November 8th! I finally decided to jump in as a guest participant, so follow along as we share weekly updates while transforming our spaces. A great place to start is to find me on Instagram and you can also follow the IG hashtag #oneroomchallenge. For this ORC I’ll be remodeling our 10′ x 10′ guest bedroom along with a sitting area in our basement. Here is the REAL challenge: I’d like to keep my budget around $500 (since I have an entire house to remodel) so I’ll be shopping my own home and repurposing secondhand items. My goal is to share practical ways that we choose to remodel our home on a realistic budget but still produce a high-end look. So…challenge accepted! We recently sold our previous house after six years of remodeling. Let’s just say we appreciate the return on investment that comes from tackling low-cost-high / high-impact home improvements. Our plan this time is to set a per-room budget in order to contain the costs. 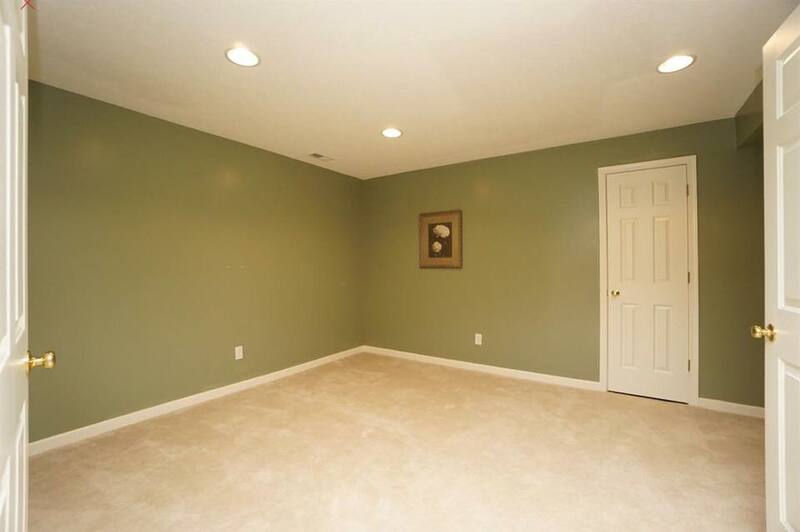 Here is our guest room, before we moved in and before I had a plan. Initially we just used this as an office for me. But I feel a bit guilty not having a space for our overnight guests who have been sleeping on the basement couch. My hope is that I can create a dual purpose office-guest-suite. I had to start by purchasing a brand new Serta mattress which ate up $200 of our $500 budget. So I’m down to only $300 to work with! And here is my design plan. I’m not sure if I can I really pull this with only $300 remaining? But I’ll sure try. I’ll thrift and repurpose my way to a finished space, but will try to capture the same modern-classic vibe that I’m going for. 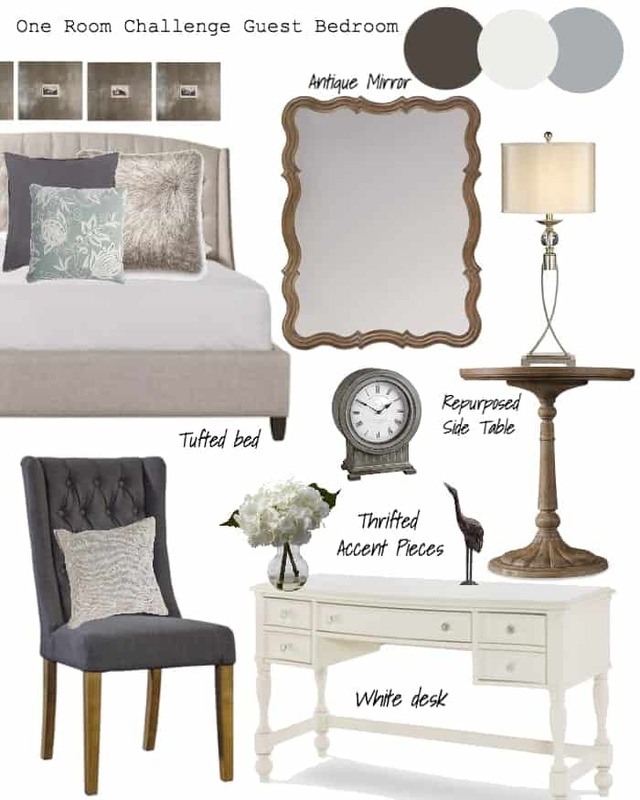 I still need to purchase the bed frame, a headboard, the night stands, the mirror and the lamps. If I were to shop my home right now, I have a white desk (formerly my vanity in my previous house), and a desk chair. Most of our smaller decor is still in boxes from the move so this process will force me to finally unpack! Be sure to sign up here to get my newsletters where I’ll notify you of my progress (and how much I’ve spent) each week. 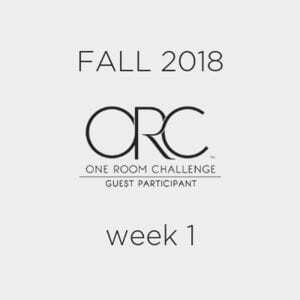 Also follow along with this hashtag #oneroomchallenge or #bhgorc on Facebook, Instagram, Pinterest and all of my social media channels. Thanks for following me on this crazy journey! I’m nervous but excited to make this space beautiful for our guests. The modern classic design you’ve chosen is almost timeless. I like the elegance of it and the fact you can still make it livable. Enjoy your decorating! Thank you, and yes, timeless decorating is a money saver in the long run. Thanks for stopping by! I’m looking forward to seeing how this comes together. I Love the the feel of this.